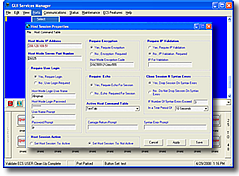 The GUI Services Manager™ provides event driven, unattended data manipulation capabilities for peripherals requiring GUI, HTML, or command-line data entry. The GUI Services Manager™ receives formatted data and, through preprogrammed scripts, can process the data and distribute results or findings to appropriate personnel. Minimizes security risks on important software systems. Controls all information obtained and entered into a GUI system (crucial in automating data entry throughout enterprise). Receives requests through email or telnet. Fully encrypted system when used in conjunction with the RLJL Suite. Ability to schedule Button Objects to be invoked at any time or any interval. Ability to execute windows functionality from remote connection. Click here to contact dscTech for more information on the Fleet Maintenence System™.